Have you ever wondered why some people accomplish so much more than you do even though they have the same 24 hours? What if you were able to make the income you’ve always wanted?How about taking a trip around the world without worry? What if you could live life without regrets? Would you be interested in that type of power? You can’t change your past but you can have the future you want by changing the actions you take right now. In The Dreams to Reality Fieldbook, Robert Chen shows you how, step by step. This fieldbook wasn’t written to make you feel good. You’re not going to find rags-to-riches stories or tips about affirmations and positive thinking. This book was designed to take any dream that you have and turn it into a reality. Robert’s focus when creating this fieldbook was to make it comprehensive, easy-to-understand and as short as possible.This book is not for someone who hopes it will work like magic with little to no effort. Each chapter ends with specific action steps that you should take before moving on. 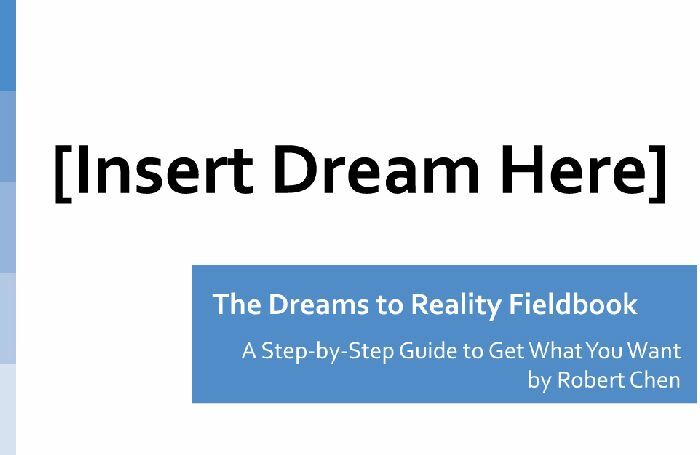 It doesn’t matter if you don’t know how to achieve your dream, that’s why Robert wrote this book. All that matters is that you want to achieve it. This book contains the information you need to turn your dreams into reality. All you have to do is to follow the steps.